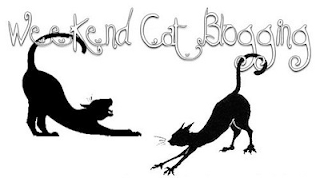 We're also participating in the Weekend Cat Blogging blog hop, hosted this week by Pam & Coco (and Angel Smudge) at Sidewalk Shoes. Um, are you gonna nom on the mom's finger? We hope you got a treat after that pic! Those beautiful eyes... and that tiny piercing teeth... LOL. Scary! By the way, we just dropped by to greet you a Merry Christmas and a Happy New Year. Hand alert hand alert! Is it tickle time? Have a super Saturday. Love the pic. Hope you're nomming on Mom and not the other way around. HAH! Concats on winning that cat tree. I like to taste (ie BITE) hands, too! Did your mom-persons hand taste good ?? Faraday you're so handsome! I just love your eyes! 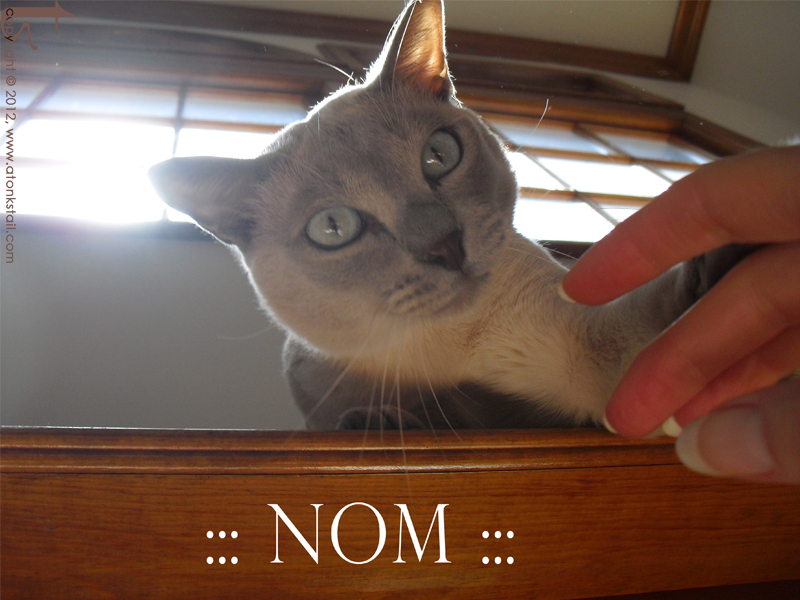 I hope that finger isn't your nom! Binga thinks my human's fingers are pretty tasty! Whatever you do, DO NOT break the skin!! Mmmm those fingers do look nommy! Those fingers look very yummy! Nom? I see no offering in that (admittedly very pretty) hand! Are you supposed to nom the finger? It might be satisfying to inflict a bit of pain as punishment for the lack of an offered treat, but the TREAT would still be better. snacking? on what?? I see nothing for that kitteh..poor little mistreated baby..
Tee hee. Mommy fingers are NOMMERS! Nommy photo - can I assume the aforementioned "nom" was on Mom's finger at the time??? Whatever it was I do hope it was delish. Saturdays are definitely for snacking (and napping). We wondered the same thing as our buddy, Gizmo!